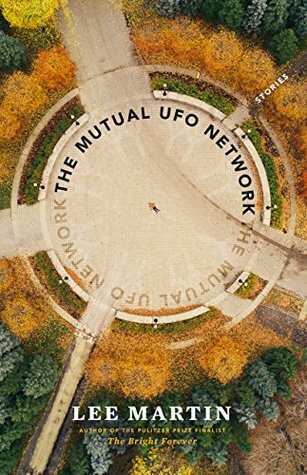 The Mutual UFO Network by Lee Martin is an excellent, very highly recommended collection of twelve masterfully written short stories. Martin has insight into the desperate lives of ordinary people, people just trying to do the best they can while dealing with emotional minefields and long-held resentments. Some of these characters have been living with their resentments and tightly withheld anger for decades. For others the tension is a more recent occurrence. Some are lying to themselves in an attempt to deal with their reality. Evey story in this outstanding collection has a visceral impact and showcases deep insight into relationships, families, and the human condition. 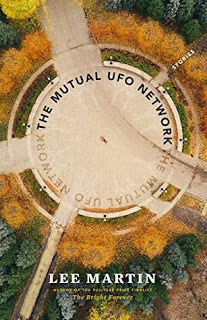 The Mutual UFO Network is an exceptional collection of short stories and is one of the best collections I've read this year. A young man's parents have separated and he recounts the last time he sees his father and his relationship with both parents. His parents operated a mail-order business called The Mutual UFO Network, which sold digitally altered photos to ufo believers. Parents buy a house for their son, Jim, to live in on his own after years of living in group homes, institutions and with his parent. The new neighbors discover his peculiarities. Belle, and older woman, shares her private feelings about her relationship with her neighbors, The Silvers, their eight-year-old daughter Naomi, and the new baby. Ancil and Lucy have been married for fifty-five years, when resentment and anger from an incident years ago resurfaces. Jackie, a boy living with a disability, has a talent for ventriloquism. One day he finds out about a classmates home life. Miss Chang, who recalls coming-of-age in China in the time of Chairman Mao, now lives in Nebraska and attends the YMCA dance class that her ex-husband teaches with his new wife, Polly. Frank’s wife mysteriously disappeared, leaving her car along the side of the road, but it is unclear if indicates a crime or something else. Del is a gullible man who tends to give money to con artists and makes worthless investments. His wife Liz, has no hesitation to let him know how she feels about it. Wink and Benny, good ol' boys, pick up a drunk girl who is hitch hiking and take her to her father's funeral. Roger, a sixteen year old, recalls when his uncle Bill Jordan, came home from Vietnam in 1972. Bill soon figured out that Annie, Roger's mother, was having an affair with the neighbor, Harold Timms, something his father, R.T., has chosen to overlook. Maizy tells her husband, James, that they should be on the look-out for a third omen after the first two. James has been making bad decisions for a while now, like gambling away money given for their ill daughter and involved himself in making crystal meth, but he wants to change. Mona and Wright who raise Clydesdales, told their adult son Gary, an addict, to either get help or leave home. He chose to leave and they haven't seen him in years. Then, when they have a new foal in trouble, Gary returns, helping them, but also needing their help. Disclosure: My review copy was courtesy of Dzanc Books.